The brand-new film “Willie Velásquez: Your Vote is Your Voice” will be screened for the St. Mary’s community in a special event Oct. 4, the day after its premiere on PBS. The late Willie Velásquez was a Latino voting rights pioneer who graduated from St. Mary’s in 1966. He established the Southwest Voter Registration and Education Project, which organized voter registration events around the country and emboldened under-represented populations with its rallying cry “Su voto es su voz” (“Your vote is your voice”). Velasquez died of kidney cancer in 1988 at age 44. President Bill Clinton awarded him the Presidential Medal of Freedom, the United States’ highest civilian honor, in 1995. The evening begins with a reception at 6 p.m. and the screening at 6:30 on campus in Conference Room A of the University Center. The event is free and open to the public. Velásquez’s oldest daughter and St. Mary’s alumna Carmen Velásquez will attend the screening and participate in a Q&A session with award-winning filmmaker Hector Galán, who directed the documentary, and his wife, Evy Galán, who produced the film. St. Mary’s President Emeritus Charles Cotrell, who taught Velásquez political science at St. Mary’s, appears in a segment of the documentary. Several other St. Mary’s graduates make cameos. The screening is sponsored by the St. Mary’s Political Science Department in cooperation with the Civic Engagement Office, Student Government Association, History Department and the UTSA Center for Civic Engagement. Student government officers will man a voter registration table at the event, and samples of Velasquez’s work curated by UTSA Special Collections will be on display. Velásquez attended Edgewood Elementary School, Holy Rosary Catholic School and Central Catholic High School before earning a bachelor’s degree in Economics at St. Mary’s. 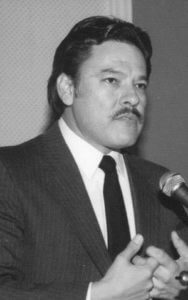 In college, he participated in the United Farm Workers Union and helped start the Mexican American Youth Organization, according to the Texas State Historical Association. He also helped found other Mexican-American civil rights organizations. “But his vision involved more than just getting Latinos to the ballot box, Velásquez sought to bring into the democratic process an active and informed Latino electorate,” according to his biography at wcvi.org. The documentary, co-produced by Galán Incorporated and Latino Public Broadcasting and largely funded by the Corporation for Public Broadcasting, is a VOCES/PBS Election 2016 special narrated by Luis Valdez. It premieres Oct. 3 at 10:30 Central on PBS.